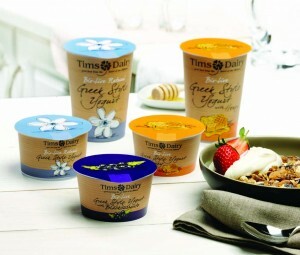 Established as a family business in central London in the 1940s, Tims Dairy remains a privately owned company specialising in high quality yogurt products. The business was started by Euripides Nicolaou and Michael Timotheou who began by making homemade natural yogurts and desserts which they supplied to local ethnic coffee bars, continental delicatessens and restaurants. Demand led to steady growth and an initial move to North London followed in 1996 by relocation to the current purpose-designed dairy in Chalfont St Peter, Buckinghamshire. The family tradition continues and Tims Dairy has, for more than 30 years, been managed by brothers Chris, Peter, Bides and Tony Timotheou (nephews to Euripides and sons of Michael). Tims Dairy believes that overall success includes manufacturing and operating in a sustainable manner and with consideration to the well-being of the environment. An important part of our business philosophy aims to protect resources and minimise impact on the environment using the principal of continuous improvement and a commitment to best practice. Tims Dairy recycles all cardboard and paper waste, and keep packaging items to a minimum. We have been engaged in a programme to reduce our carbon footprint and have recently conducted a review of operations with the Carbon Trust, with the objective to further reduce energy. Food provenance and local sourcing are also important issues for today’s consumer, so we have a ‘green policy’ which involves constantly reviewing the source of our ingredients and packaging to ensure maximum quality with minimum effect on the environment. Over 90% of our packaging and ingredients are sourced in the UK. Improving on the provenance of our fresh ingredients means that you can trust our products even more, and that they are ideal for growing children as part of a natural and healthier diet. All the fresh milk used to make our yogurts comes from a dairy in Somerset and we source as many of our other ingredients from UK producers. We like to support the local community in the Chiltern area and are committed to business growth with care and consideration. We have been members of the Buckinghamshire, Berkshire and Oxfordshire (BBO) food group since 2003, which promotes the supply of local products in the area.